Learning to sail is a story of steady progression from a complete novice to an experienced sailor and it all comes with practice. It begins with learning the very basics, from knowing which parts of a boat are which, to the laws and regulations that govern sailing. Aspects such as first aid and survival at sea must also be covered to ensure that a sailor is capable of dealing with an emergency situation should one occur. When it comes to actually handling a sailing boat and learning to sail, there are three main basics that need to be covered – how to anchor, how to tack and how to dock. Good anchoring techniques are essential for safety as it prevents boats from drifting uncontrollably when they should be secure. There is no excuse for laziness when anchoring and simply tossing the anchor is not guaranteed to work – all that is required is a few careful steps that are taught on most courses. Conditions will have an impact on an ability to anchor so recognising potential changes in tides, currents or winds is vital. Should the boat be pulled in the opposite direction, the anchor could be pulled out regardless of how well the process was originally done. The best anchor sites are ones that are protected from the wind and rain, and many charts will show the characteristics of the sea floor where they are known – the ideal bottom is sand or mud. Preparation is key and the anchor should be ready before an approach is made, while the length of anchor should be carefully measured. Staying clear of other anchored vessels is important to prevent collisions. The approach should be slow and once in the desired position the anchor should be carefully lowered until the rode is tight – signaling that the anchor has reached the bottom. A sailboat can sail at roughly 45 degrees off the wind, meaning it’s possible to sail northeast or northwest if the wind is coming from the north. 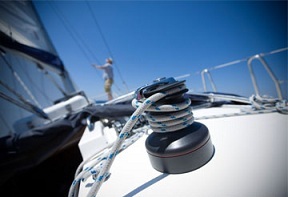 The process of tacking involves the turning of the boat from one side of the wind to the other by turning through the direction the wind is coming from. 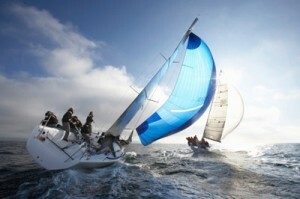 The mainsail should be in tight and the boat should be sailing as close to the wind as possible when preparing to tack. Other people on the boat should be alerted – often with the command ‘ready about’ and the sailor carrying out the task should be set to move from one side of the boat to the other, ducking under the mast. All equipment and lines should be clear as the process could capsize the boat if not – and tacking should be done quickly and in a coordinated fashion. If the process is done without enough speed then the boat may stop when it faces the wind – called being in irons – in which case a sailor must wait until the wind swings the sail again. Oversteering can also make the process more difficult, while sails can get caught up which will then require clearing in order to continue. The process of tacking relies on coordination and will be perfected with practice although the basics can be picked up very quickly when undertaking sailing lessons. Bringing a boat in to dock comes with practice, but in a similar way to parking a car, if sailors follow a set of simple steps it all becomes second nature. The approach should be done slowly and at a shallow angle; and in to the current if possible as that will also slow the boat down – don’t rely on reverse gear as it won’t stop a boat that is already moving too quickly. Fenders should be in place long before the boat reaches the dock, while a sailor should never put their body between a boat and the dock in order to avoid serious injury. Once the boat is barely moving, a sailor should then take the dock lines and secure them, or pass them to a helper if another person is around. In the case of the latter, it’s always best to check knots and lines to check everything has been done properly. Knowing basic processes makes sailing a safe and enjoyable experience for all – while the aspects mentioned here are covered in greater depth on both practical and theory sailing courses.